I don't know what to make of Venice. Venice is a maze. The streets are labyrinthine and windy, and so narrow that you can barely see to the end, and so high that even if there were landmarks you wouldn't be able to see them. You end up following a sequence of signs - some official-looking, some basically graffiti, towards landmarks which may or nay not be there in the most roundabout route possible. To put it bluntly, you have no idea where you are. Venice apparently exists entirely to sell you things. There were so many shops. So many. And not the kind of shops you would expect to see in a city, like... I dunno, supermarkets and locksmiths and computer shops. These were all leather and lollies and venetian glass jewellery. Which you don't really notice - it just feels slightly off somehow - and then it suddenly throws you off and makes you reevaluate the last hour of your life as basically windows shopping. The worst part is that I can't buy any of it, because the things that I liked were wallets and pens, and I have those things already, with addee bonus sentimental value. I mean, I guess that's a good thing, since it saved me money, but still. Venice is literally entirely populated by tourists. It's like a city-sized museum. Wait, no. It's like Disneyland. Or that one town in America which is owned entirely by Disney as a pseudo replica of Small Town America. It doesn't quite feel like the real thing, even though technically it is. Here is my question, then: who lives in all these houses? 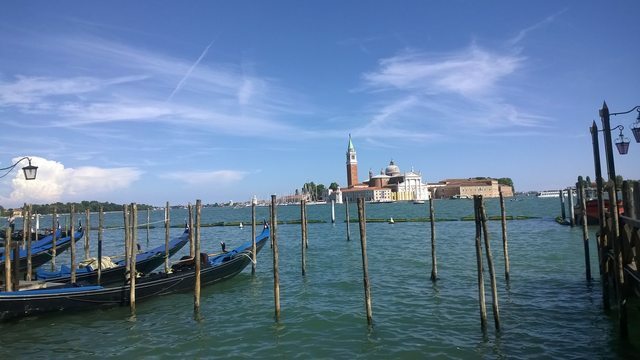 Venice is the place where that one bit of Casino Royale was filmed. I remembered this when I saw the not-actually-that-uncommon coincidence of one of those water taxis going past a building with one of those giant photograph scaffolding facades. Venice is also in Assassins Creed. 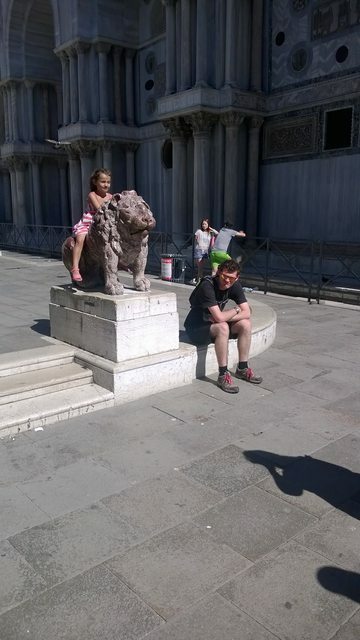 I remembered this when we walked into St Mark's Square, and Morgan said, "This is the Doge's palace. At least I think so, it's where he was when I killed him." I'm surprised the aren't selling T-shirts. For a place that's in popular culture a lot, it doesn't actually have that many landmarks. Venice is all about the gondolas and the canals and the concept that the entire city is sinking, and that impression gets more and more watered down (no pun intended) the more people walk through it. The maze doesn't make any more sense from up high. 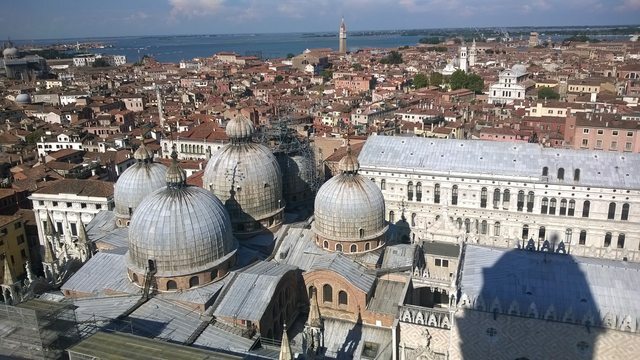 We climbed the Campanile in St. Mark's square - well, I say climbed. We wanted to climb. We were all psyched and ready to climb. And then they put us in the lift. The bloody cheek! 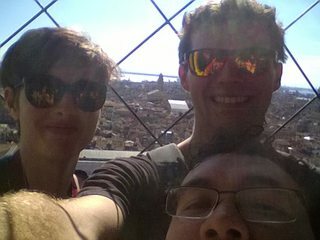 Anyway, we ascended the Campanile in St Mark's square, and apart from the Grand Canal swirling its way through the centre of the city like Nutella through gelato, there isn't any obvious organising principle. At least Florence is roughly like a grid, even if it is a skewed, ancient grid. Venice is just chaos. This is probably because the place is really, really old. As Morgan put it: "I like how the structural foundation for this city is basically just more city." Much like in Dublin, which is similarly disorganised in its urban planning (or lack thereof), where despite fires and demolitions the property lines remained the same, I suspect the routes of streets and canals in Venice are constrained by the need to build them on solid land. You can't just bulldoze a building because you want a new street, because there's bridges and all kinds of other stuff you have to keep in place. Thus, I'd guess that Venice looks much the same today as it did at pretty much any point in it's history. 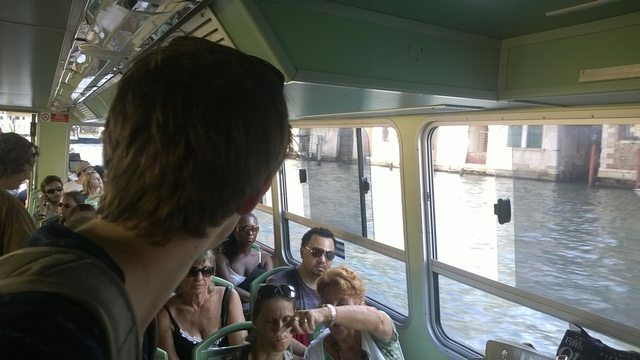 We took a water bus back from the square, which is at the opposite end of the maze from the train. The water bus was fascinating, cause it had all the trappings of a Metro - the line map, the fare gates, the whole deal - but it was just a biggish boat that drove down the canal. It was actually loads of fun, in a weird way. I'm really glad we did it. Venice makes a bit more sense from the water, and is a lot more pleasant and authentic somehow. Everything is basically linear - the Grand Canal is the trunk, and all the branches come off that. The public transport and pretty much all the essential city traffic use the canal. The complexity of the interior streets disappears. And it all has waterfacing entrances. Venice really does have canals where there should be roads, and they function like roads, and the city is patterned around that assumption. The footpaths, while pleasant to wander, are entirely incidental. There was some back and forth over whether Venice was sinking, or whether the sea level was rising, and between these two, how long Venice has left. The answer appears to be both. It's built on centuries old wooden piles, but they aren't the problem - it's the water they started extracting from the local aquifer in the 60s. They banned wells, and now the subsidence has stopped (they think) - only to be replaced by rising sea levels. So the short answer is that nobody really knows. I think the idea that Venice will one day vanish into the depths might be one of the driving factors of this colossal tourist engine. Venice has not degraded as gracefully as Florence, despite both being capitals of the renaissance. Florence has maintained its integrity, and found a place in the modern world as a university town and a storehouse of culture. Venice has sort of become a tourist trap, grinding money out of people by pouring them through a maze. It's not the mysterious city I imagined. It's just a mysterious-city themed theme-park come shopping centre. It's a little bit sad, really. Still, at least I saw it before it sank, right?